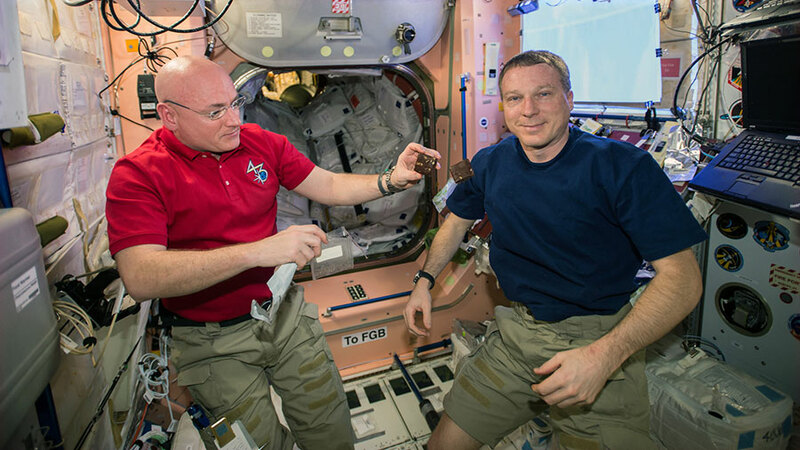 ISS043E198419 (05/15/2015) — NASA astronauts Scott Kelly (left) and Terry Virts (right) share a snack while inside the station’s Unity module which holds the food and drink supply for the U.S. segment of the International Space Station. The Leonardo Permanent Multipurpose Module (PMM) has been reopened at its new location on the forward port of the Tranquility module. Commander Terry Virts and Flight Engineer Samantha Cristoforetti worked on completing PMM configuration activities. Meanwhile, the Expedition 43 crew went about its scheduled tasks of microgravity science and orbital maintenance. One-Year crew member Scott Kelly and cosmonaut Gennady Padalka joined each other for the Fluid Shifts study. That experiment observes how upper and lower body fluid shifts may affect a crew member’s brain pressure and vision. Kelly’s fellow One-Year crew member, Mikhail Kornienko, explored how fluid changes in microgravity can affect a crew member’s immunology and blood pressure for the Morze experiment. Flight Engineer Anton Shkaplerov primarily worked maintenance in the station’s Russian segment.